Investors are nervous, which is a permanent feature of the markets, with a few exceptions. But today, after nine years of consecutive stock market gains, it’s completely normal that people are looking for clues as to when this bull run is going to end. People who pay close attention look for divergences in the advance-decline line and they look for extreme sentiment readings in the the fear & greed index. 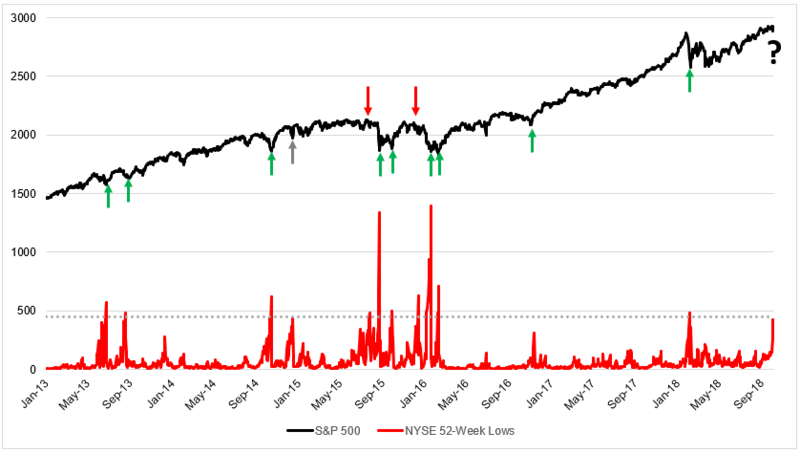 One of the more popular measures of market conditions is the NYSE 52-week lows (and highs), which recently measured some decent activity for the first time since February. You can see in the chart below that these spikes have tended to coincide with market bottoms. In bull markets, wash outs are bullish. Unfortunately, by the time we finally realize we’re in a bull market, people start searching frantically for signs that it’s going to end. There are over 1900 stocks listed on the NYSE. Non-U.S. companies represent one-third of the NYSE composite market cap. 52-week lows are a lagging indicator. These spikes seem buyable looking backwards, but if you’re actually trading, by the time these spikes occur, you’ve already felt some serious pain. There are 25 S&P 500 stocks that are within 2% of their 52-week low. The average distance from their 52 week high is 30%. This doesn’t take into consideration outside forces, like the fact that the ten year treasury rate is as high as it’s been since 2011. Spikes in 52-week highs have corresponded roughly with market bottoms, but does this make you any more likely to rush out and buy the next one? Of course not, because they all feel like the top in real time, and one of these times will mark the top. A single indicator doesn’t tell you anything. A single indicator can’t possibly tell you the whole story. But the potential problem with using multiple indicators is they can reveal anything you want to believe. Everybody wants to know when this movie ends, but as Matt Damon told Bill Simmons, “you don’t see the movie before you make it”. This is a great reminder that nobody can see the future. We know this bull market won’t go on forever, but we can’t know when it’s going to end.